We are so proud to announce our next instalment of our LIVE! 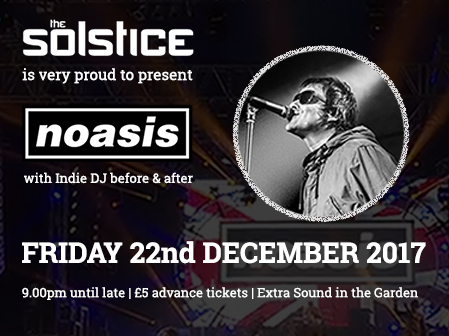 Music sessions on Friday 22nd December from 9.00pm with the amazing NOASIS back in the building, who will be performing in the SolGarden with Extra Sound this time too! and believe us this will be one to attend no matter what! The final day of work for most people and this is going to be so busy as we had so many in the SolGarden for the last session in April this year and we aim to top the attendance and atmosphere this time around! What a Christmas Party we have planned! Noasis will be performing LIVE! in the SolGarden from 10.30pm and we have our resident Indie DJ warming you up & continuing the party after the guys perform until the early hours. 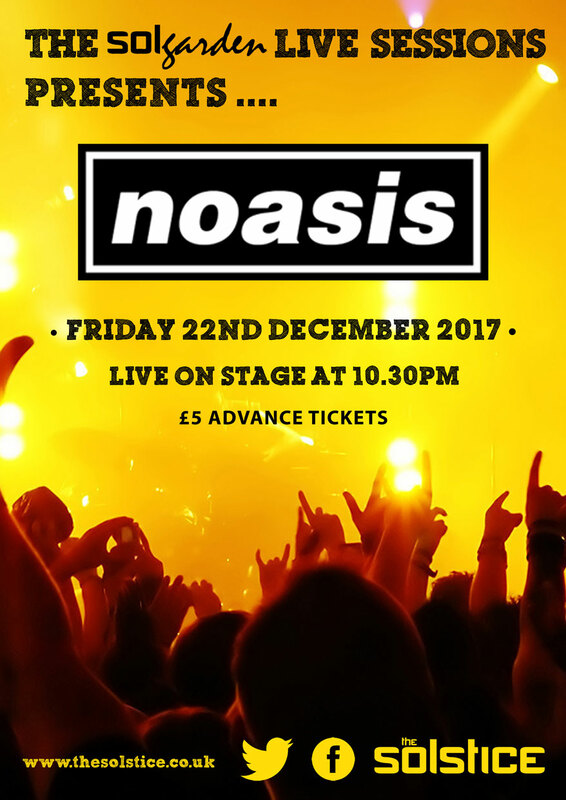 Noasis is the definitive tribute band to Manchester's five piece super group Oasis. Since their formation in 2006 and with over 400 performances to date Noasis has justly earned its reputation. With an obsessive attention to detail the band recreates the real Oasis experience with amazing energy playing all the classic songs as if they were their own. This is more than a tribute band this is Oasis from a parallel universe. Check them out via these links seeing them in action; Times: 9.00pm until 4.00amEntry: Advance tickets are on sale NOW priced at just £5 inc BF (limited numbers) this will give you access to the SolGarden & all areas on the night, numbers are VERY limited so make sure you get yours TODAY! To buy tickets for this event please visit our events page: NOASIS LIVE! tickets from Skiddle.